A water jet cutter is a tool capable of slicing into metal or other materials using a jet of water at a very high velocity and pressure, the water can be mixed with other abrasive particles to aid the erosion of the metal. These abrasive particles can be in the form of suspended grit or aluminium oxide. To get the pressure used into context the pressure fired out the end of the nozzle in a water jet cutter is around 30 times more than a car pressure washer. Water jet cutting can be very versatile in its potential, e.g. it can be used to cut things such as fish sticks all the way to titanium, however some tempered glass cannot be water jet cut, some ceramics also have this problem, while diamond is just too tough. The cut kerf (width) can be adjusted by changing the nozzle parts along with the abrasive grain size. 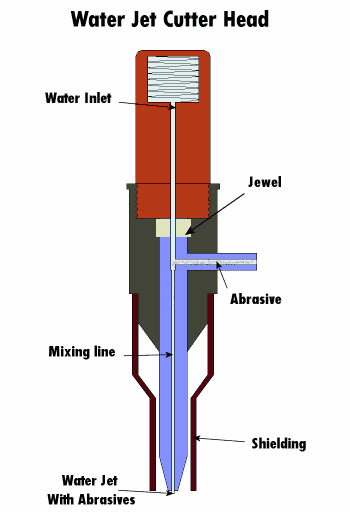 The typical cutting jet size when using abrasive particles is around 1mm-1.3mm, although this can be reduced to almost 0.5mm. When cutting without the use of abrasive particles then the jet size can be further reduced to around 0.08mm. How fast does a water jet cut? An abrasive jet can cut half-inch thick titanium at the rate of 7 inches per minute when a 30 HP pump is used. The abrasive jet moves in a manner very similar to a slowed-down pen plotter. Water jet cutting does not apply heat to the material it is cutting, therefore there is no possibility of work hardening happening. Cutting hard metals such as tool steel seriously affects the cutting speed, therefore water jet cutting is not an efficient method of machining these hardened materials. Cutting thick materials results in a taper down the cut resulting from the water jet widening as it get further away from the nozzle. This means dimensional accuracy in thick cuts becomes a problem.